happy easter weekend! 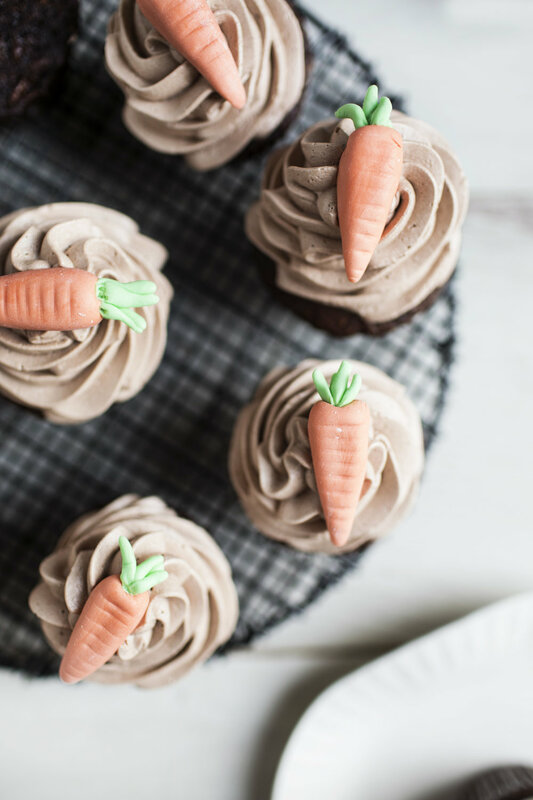 it just isn't an easter celebration without a carrot based dessert, am i right? i think the easter bunny would agree too. 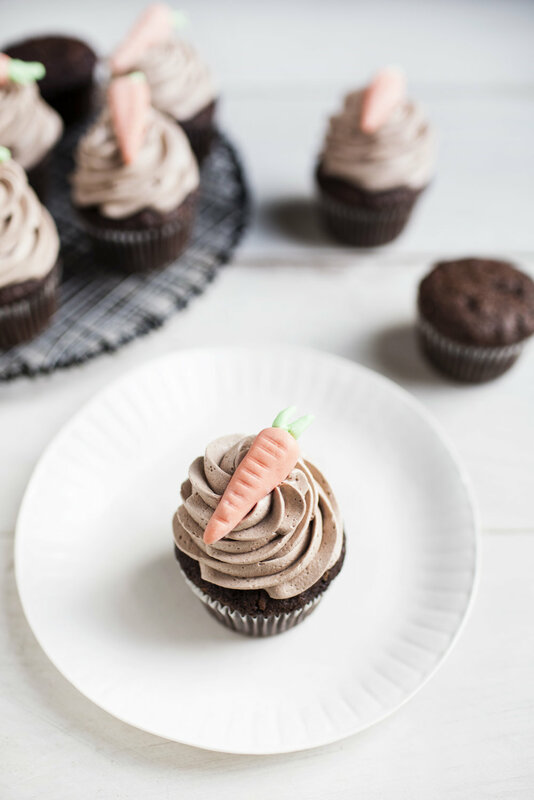 this year, i am mixing things up a bit with a chocolate cupcake twist on the traditional easter carrot cake. both the cake & frosting feature hints of cocoa, so you get a chocolate bite in each layer. i don't know why chocolate carrot cake isn't more popular, it's so good! let's change that, okay? this recipe features bob's red mill's high quality unbleached white all purpose flour. however, bob's red mill produces so many different baking flours that you can easily substitue equal parts gluten free flour or a portion of whole wheat flour. 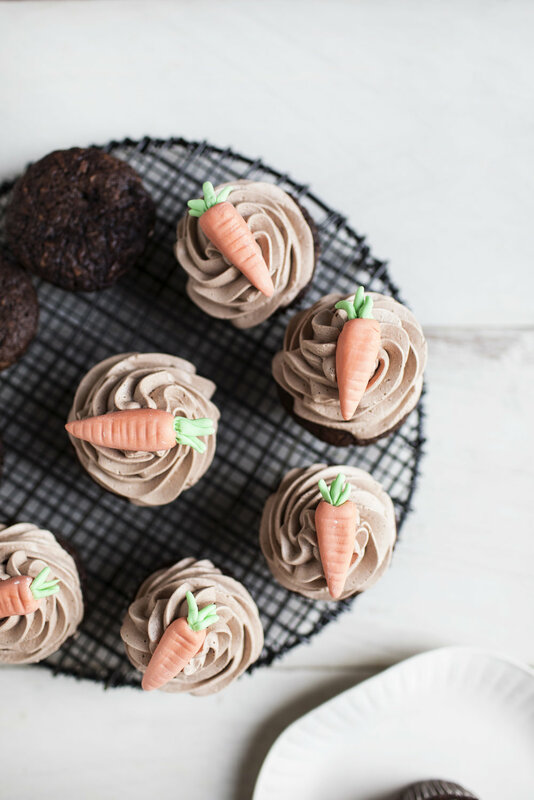 when it comes to hosting an easter brunch or potluck, cupcakes can be much easier to both prepare & serve, but this recipe can also be made into a layer cake, loaf cake or sheet cake if that is your preference. it is so versatile! 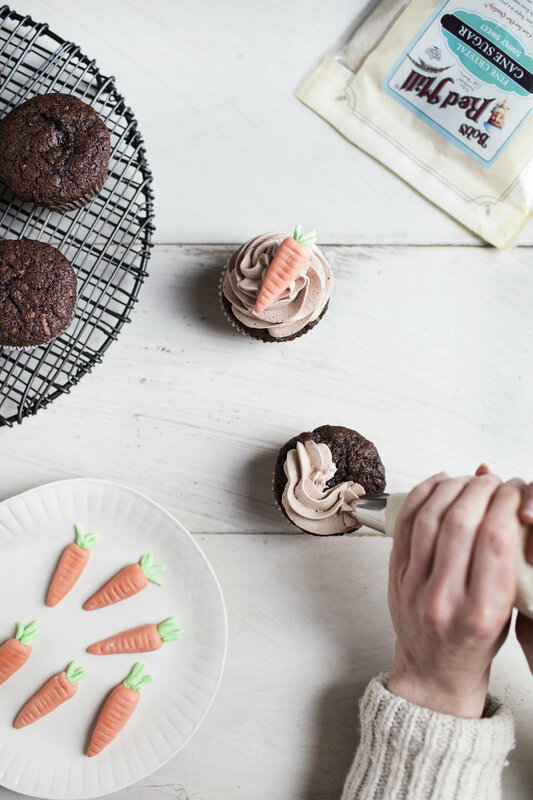 i topped each cupcake with the cutest little fondant carrot. 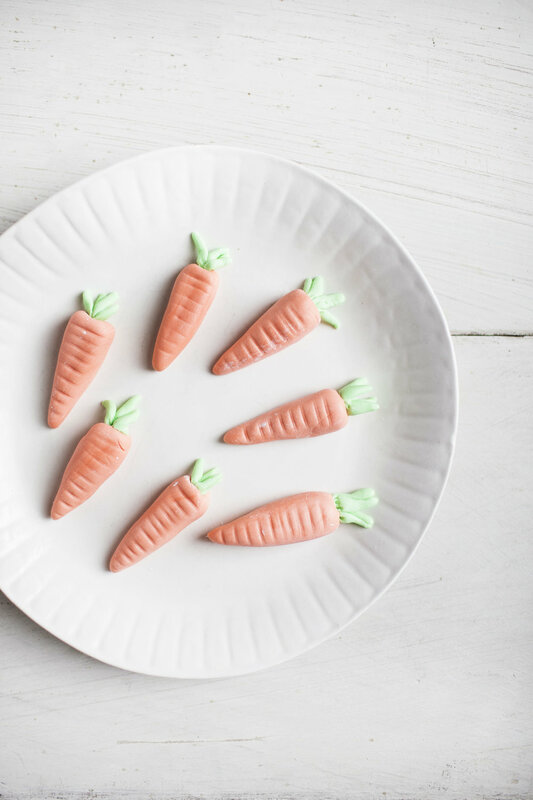 i made each fondant carrot by hand, pinching them into the shape of a cartoon style carrot & topping them with a green stem. i won't lie.. it was pretty time consuming to make each one, but totally worth it. have a lovely easter friends! preheat oven to 350 degrees. line two 12 tin cupcake pans & set aside until ready to use. in a large mixing bowl whisk together the oil, sugar, eggs & vanilla until smooth. 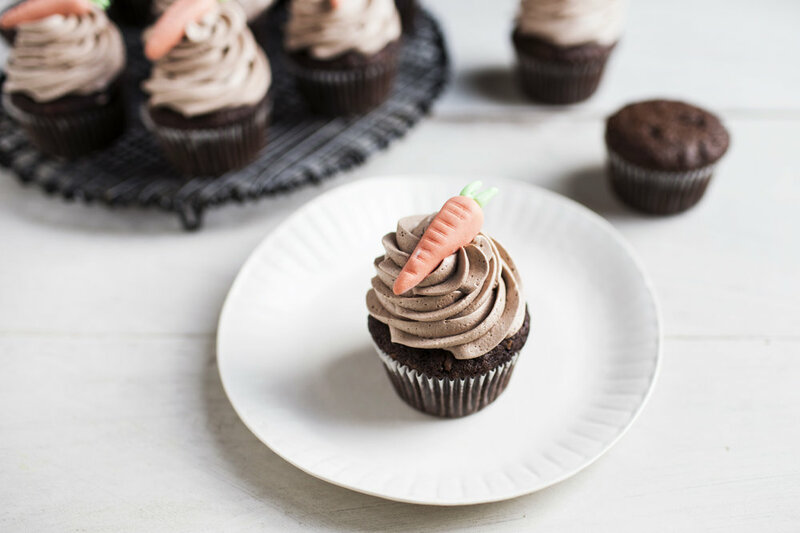 stir in the pineapple, carrots & cocoa powder until the cocoa powder is well blended. sift in the flour, salt, cinnamon, nutmeg & baking soda. stir until batter comes together & no clumps remain. be careful to not over mix! divide mixture evenly amongst the prepared cupcake pans. bake for 18 to 22 minutes, or until the top bounces back to touch. remove from tins & let cool completely before frosting. in the bowl of a standmixer fitted with the paddle attachment, add the butter & cocoa powder. beat for 60 seconds. add the powdered sugar & vanilla extract. beat until light & fluffy, about 8 minutes. be sure to scrape down the side of the bowl one or two times. add the cream cheese in chunks & beat until just incorporated, about 60 seconds. 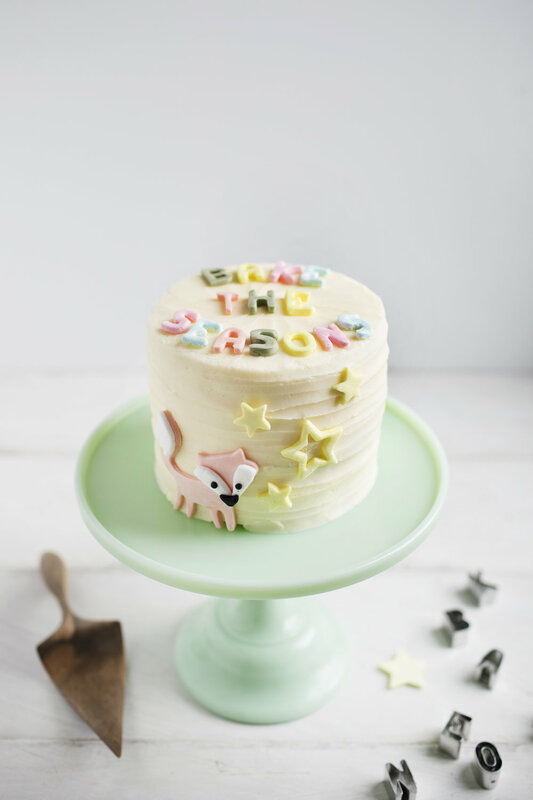 transfer frosting to a piping bag fitted with a star tip. pipe frosting as desired & top with fondant carrots if desired. hi friends!!! what a week it has been with the launch of my cookbook, bake the seasons. it is seriously the best feeling ever seeing the book out in the wild in stores & in your homes! the spring chapter features so many amazing recipes for all types of easter celebrations. so if you haven't got your hands on it yet, click here to order yourself a copy! 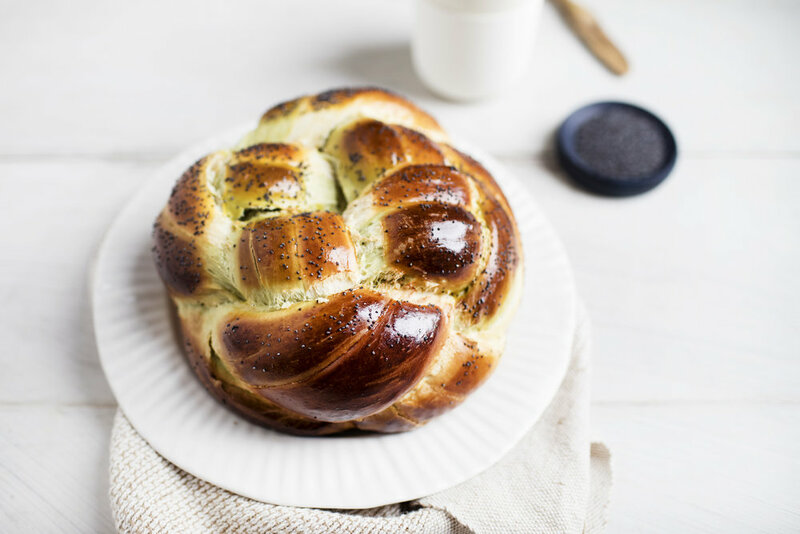 another perfect recipe for easter is this vanilla & green tea sweet bread. it is my take on the traditional easter bread. i can't get enough of the two tone colours of dough intertwined with each other. 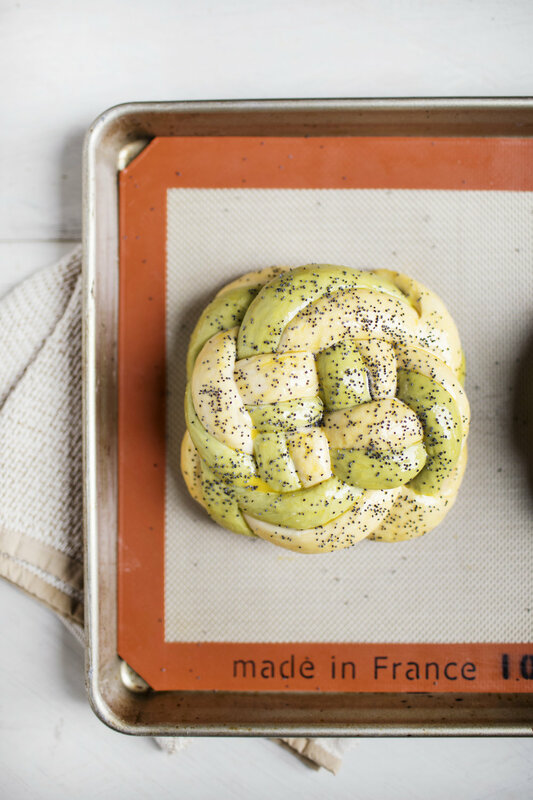 to make this easy, i linked to a tutorial on how to braid the dough this way. it is the same tutorial i used to figure things out! 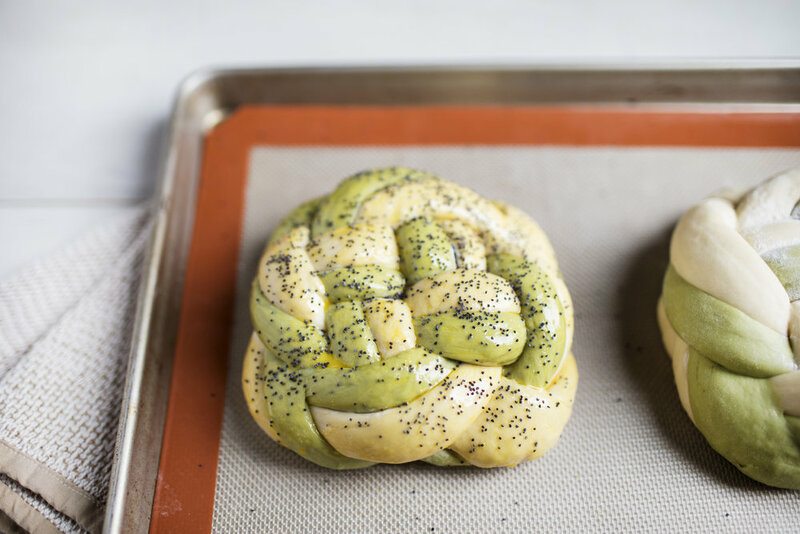 like a classic egg bread, this bread is very lightly sweetend. it features hints of vanilla & green tea, using aiya america's cooking grade matcha powder. 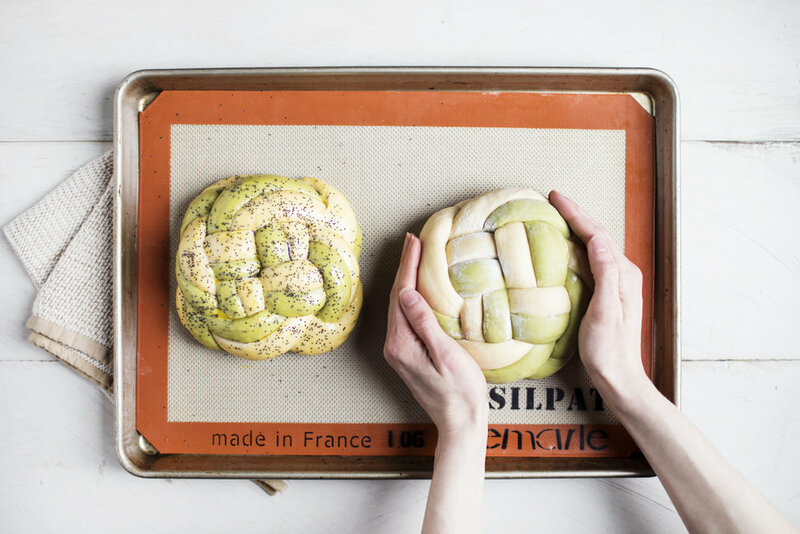 the matcha powder is what gives the bread its natural colouring. this recipe makes two loaves, so if you accidentally eat one before the guests arrive, you'll have a second one to spare. stay tuned for a few more easter inspired recipes, as i get back into the swing of things post book launch! in the bowl of a standmixer fitted with the dough hook attachment whisk together the yeast, 1/4 cup warm water & 1 teaspoon sugar. let stand for 5 minutes to allow the yeast to activate. in a separate mixing bowl whisk together the egg, vanilla, salt, melted butter, remaining water & remaining sugar. transfer mixture to standmixer bowl. add the flour one cup at a time, until dough begins to come together. using the standmixer or your hands, knead the dough for an additional 8 minutes. grease bowl & shape dough into a ball. place dough back in bowl & cover with a damp tea towel. allow dough to rise for an hour, or until it doubles in size. in a separate mixing bowl whisk together the matcha, egg, vanilla, salt, melted butter, remaining water & remaining sugar. transfer mixture to standmixer bowl. whisk together the yolks, water & vanilla. set aside until ready to use. divide each dough into 8 even pieces. shape each piece into a 12 inch long rope. 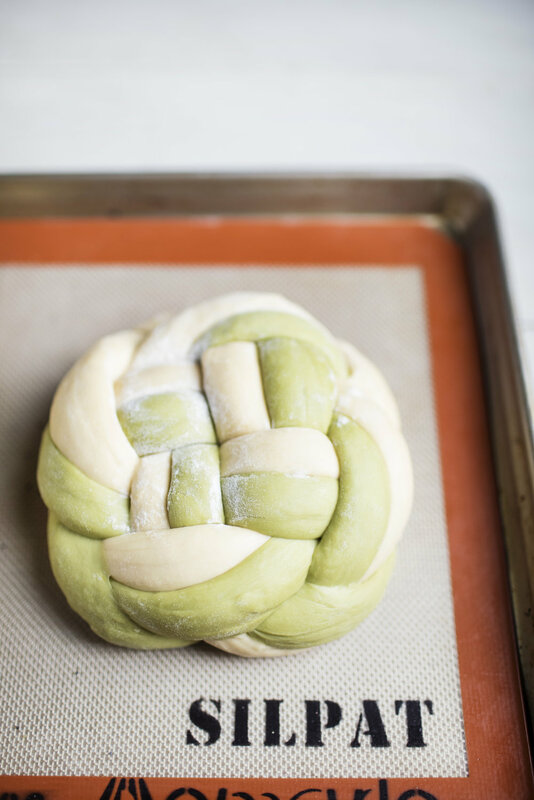 follow this video tutorial closely, outlining how to braid the bread into a round braided loaf. transfer each loaf to a lined baking sheet. brush generously with the prepared egg wash & sprinkle with black sesame seeds. bake at 325 degrees for 15 minutes, turn oven to 400 degrees & bake for an additional 30 minutes. let cool slightly before slicing into. eat within 48 hours. thank you Aiya America for sponsoring this post! today is finally the day!!!!!! BAKE THE SEASONS is officially out. oh wow, i couldn't possibly write into words just how excited (& a little nervous) i am. this book took me two long years of hard work to create & it is finally ready for everyone to hold in their hands. it features over 100 seasonal baking recipes, both sweet & savoury. think cakes, pies, cobblers, scones, pot pies, quick breads, gratins & so much more. it is available everywhere books are sold, both in store & online! now there is only one way to celebrate a milestone (& a books birthday) like this & that way is with cake, obviously. 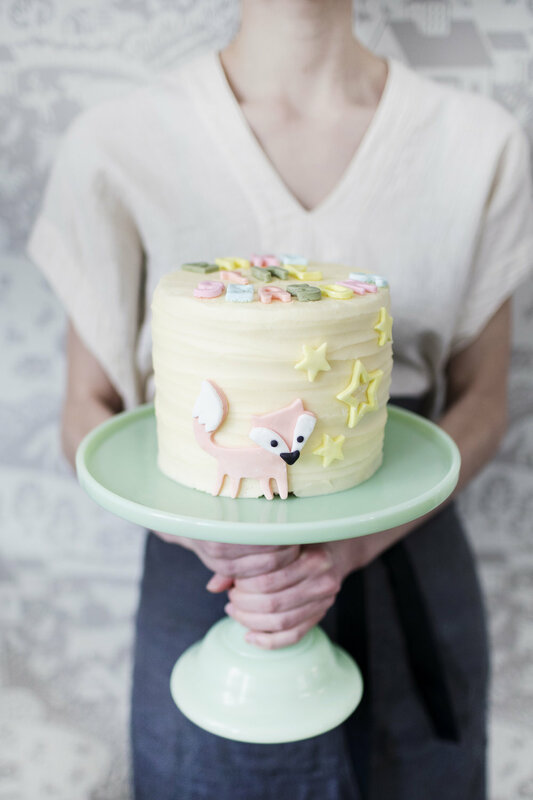 today i am sharing the recipe for an olive oil & almond layer cake. my mom gifted me these little alphabet cookie cutters at christmas & i have been dying to use them. how cute are they?! 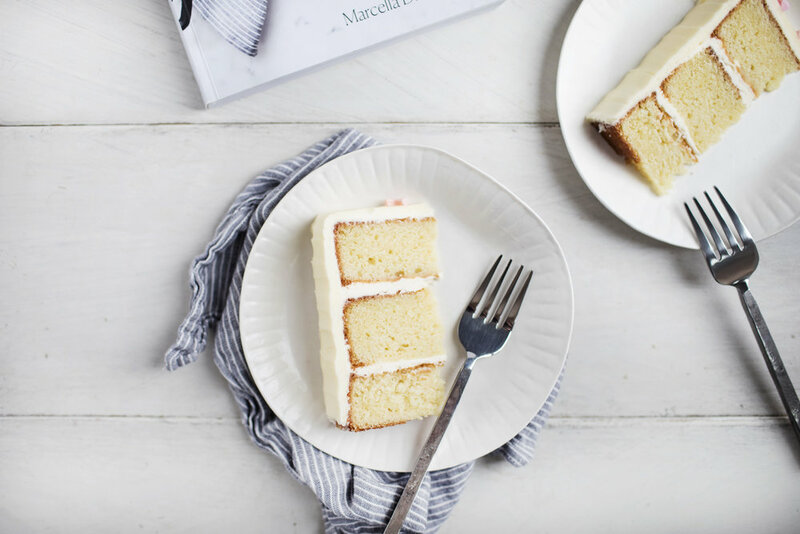 flavour wise, the olive oil brings a richness to both the cake & frosting, but be sure to use extra virgin olive oil to produce the correct fruity flavours. lastly, with the book launch i will be running a few instagram giveaways of my favourite kitchen items. spoiler: giving away the most gorgeous matte grey kitchen aid stand mixer as we speak, so head on over to instagram to get your entry in. now get to your closest book store or head on over to amazon to grab yourself a copy of BAKE THE SEASONS. enjoy a slice of cake while you are at it too! 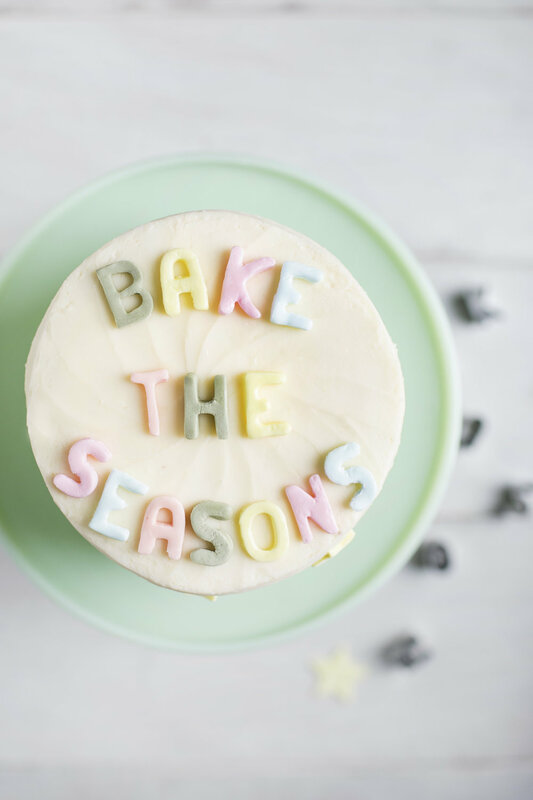 thank you for all your support over the years with this blog & for your continued support with the cookbook, BAKE THE SEASONS. i hope you fall in love with baking from it as much as i did creating it! preheat oven to 350 degrees. grease & line three 6-inch round cake pans. set aside until ready to use. in the bowl of a stand mixer fitted with the paddle attachment, cream the butter & sugar. add the eggs one at a time, scraping down the bowl after each addition. add the vanilla extract, almond extract & olive oil. beat until incorporated. in a separate bowl sift together the flours, baking powder & salt. alternte between adding the flour mixture & milk to the stand mixer bowl. beat until batter is smooth, about 2 minutes. evenly divide mixture amongst the three prepared cake pans. bake for 20-25 minutes, or until the top bounces back to touch. allow cakes to cool completely before flipping & frosting. if desired, trim dome off the top to produce a flat cake. in the bowl of a stand mixer fitted with the paddle attachment add the butter, sugar & salt. cream until light & fluffy, about 10 minutes. add the olive oil, vanilla extract, almond extract & whipping cream. beat an additional 60 seconds. frost cake as desired!